Oh La La! is a charming and sophisticated acoustic quartet ,amplified according to your requirements. We perform instrumental and vocal songs ideal for listening and dancing to. 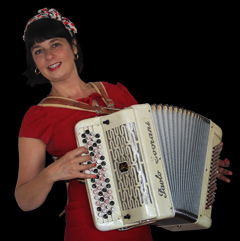 I can also perform as a solo accordionist or with Olly, Alex, Colin or Julian as a duo or trio act. We enjoy performing for concerts, festivals, weddings, parties and more. We can also walk around the tables as we play for that "Je ne sais quoi" feeling. Our huge repertoire includes classic jazz, "Musette" (Parisian folk), "Chansons Realistes "(made famous by Edith Piaf), Chansons Francaise (French songs originally sung by Nougarro, Gainsbourg, Jeanne morreau, Henry Salvador, etc...), Impressionist music ( E Satie ), music from Offenbach and selected classic pop tunes. You can visit our repertoire page to find out more. New albums on sale! Click here for more details . Wednesday 9th October Crazy Coqs @Zedel. 7 pm start.